Chances are if you look around your homestead you will find many items that you no longer need or want. Whether they are broken, outdated or you just have no use for them, don’t throw them out just yet! Consider reusing them by upcycling. Upcycling is the art of taking everyday objects that are either old or useless and transforming them into something new and improved. This is a wonderful activity that not only helps the environment but can also improve your homestead and save you money. Using materials such as tin cans, empty jars, pallets, and old clothing, you can create furniture, decorations, and practical items for organization and entertainment. Gathering materials will be the first step in upcycling, and fortunately this can be as easy as taking a walk through your house or outside on your property. Be on the lookout for common everyday items, scrap materials or objects that are no longer used or functional. Popular items to upcycle can include empty coffee cans, old wheels, farming implements, clothing, silverware, VHS tapes, books, and more. Where you see trash, try to reimagine the object into something useful and beautiful. Also, you can visit garage sales, flea markets, or thrift stores to find low cost materials. Once you have collected your materials, you can start collecting additional supplies to complete your project. Upcycling projects vary greatly in their complexity, so it is helpful to have some basic supplies and tools on hand. You may even wish to prepare a supply kit that is readily accessible for when you upcycle. Some supplies you may want to include in your kit are glue, scissors, a hammer, nails, pen, ruler, tape, acrylic craft paints, and paint sealer. If you have power tools, or have a neighbor who will let you have access to theirs, then these could also come in handy. For the projects described below, power tools are not a requirement, but they can help you complete your project more quickly. Now that you have gathered materials and supplies, you will need to select a project. There are a couple of things to keep in mind when choosing a project. First, consider the material you want to upcycle. Maybe you have a box of old rulers or a empty coffee cans you are hesitant to get rid of. Second, it is helpful when you are choosing a project to pick one based on your skill level. If you are a hobby carpenter, you will probably be able to master and excel at more complicated projects involving power tools and labor. However, if you are more of a beginner, choose a project that suits your individual skills so that the process of upcycling does not become overwhelming. Upcycling is meant to be fun. Regardless of skill or background, anyone can upcycle. Even children can assist adults with safer tasks. Third, when you are choosing a project think about what you need on your homestead or what you could use to help it run more smoothly. If your homestead would benefit from organization, choose a project that meets those needs. 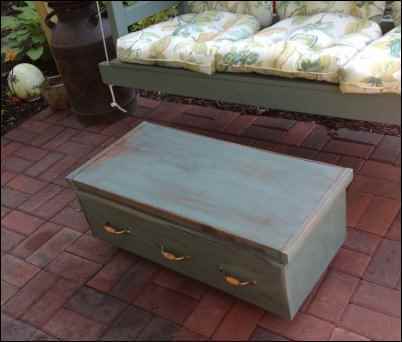 Or if you are in need of a piece of outdoor furniture, consider upcycling your own. You can make your very own functional furniture using upcycled materials. If you find an old trunk, you can make a unique coffee table or TV stand. 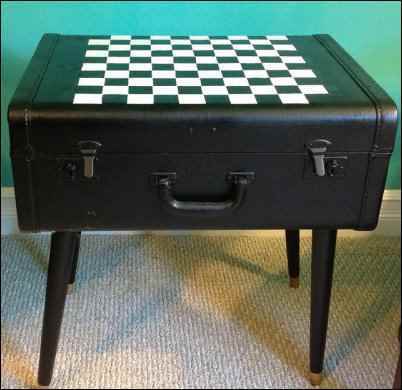 Any type of trunk will work whether it’s made of wicker, metal, leather or wood. First, clean the trunk very well inside and out, then purchase or cut a piece of glass to size for the top. Or if you prefer, you can also leave the top of the trunk exposed. Just be careful about putting liquids and foods on the surface to prevent damage. As an added bonus, you can use the inside of the trunk for storage. You may want to consider gluing a piece of felt or other non skid fabric to the bottom of the trunk to prevent movement and damage to floors. If you are in need of an end table, a birdbath may provide a unique solution. Turn a clean (and water free!) birdbath into a decorative table by simply adding a piece of round glass to the top. Consider adding potpourri in a color that accents the room and a strand of white lights for a grown-up night-light. The lights also heat the potpourri, creating a lovely scent in the room. Be sure to only use the lights in a concrete birdbath, instead of a plastic or resin one as it could be a fire hazard. A milk can can also be turned into an end table by adding a piece of round glass or wood to the top. These are suitable for indoor or outdoor use. However a milk can left outdoors will most likely rust, so try to keep it covered and protected from harsh weather. 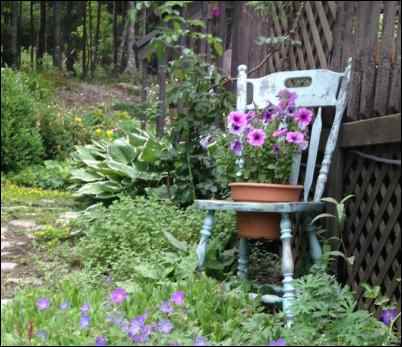 If you are a painter, you may want to paint the milk can in a landscape or floral scene to accent your home. Alternatively, a milk can can be used as a unique artificial plant container. Simply add your choice of decorative plants. In addition to functional furniture, frugal home décor can also be made using a variety of supplies including rulers, buttons, and greeting cards. Picture frames can easily be fashioned using rulers. Glue the rulers together forming a square or rectangle depending on your picture. If you are looking to frame a photo of 4×5 or 5×7 or a larger print for decoration, rulers can be cut to the size of the picture. This can be accomplished with a small handsaw, but be sure to sand any rough edges after cutting them to size. If you do not want to cut the rulers, you can add a photo mat or colored piece of paper to the back of the picture to fill in any extra space. The photo mat or paper can either be glued or taped to the back of the completed ruler picture frame. In order to protect the picture, use acid free glue and tape. Rulers can also be glued horizontally to the bottom of a tray with handles to make a distinguished paper basket. If you have extra buttons lying around, consider making inexpensive holiday decorations. First purchase pre-cut wooden shapes from a craft store, such as a heart or star. If you are handy with power tools, you can cut your own shape out of extra wood. Next paint the wooden shape an appropriate color whether it’s green for Christmas or blue for Independence Day. 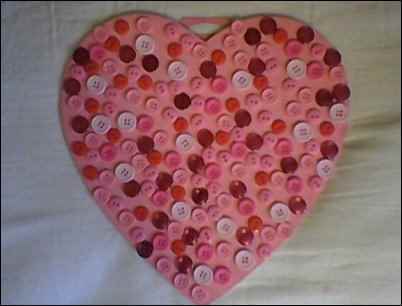 Using buttons of similar colors (ex: red and green for Christmas, pinks and reds for Valentines Day) glue the buttons onto the dried the paint. You can create a pattern or design or add them at random. Using a ribbon cut to size, glue or secure both ends of the ribbon with a staple or thumbtack on the top back of the shape to create a loop for easy hanging and display. After the holidays are over, you may wonder what to do with all of your greeting cards. Greeting cards can easily be upcycled into holiday decorations. One way to accomplish this is to simply frame the greeting card. Alternatively, decoupage is also an option. Cut the greeting card to the size you want (use only one layer of card). Next, purchase or cut a rectangle out of wood which is slightly larger than the card and paint the wooden block in a color of your choice. You can purchase decoupage glue such as Mod Podge, or you can easily make your own by mixing well equal parts of white glue and water until smooth. Glue greeting card into place by painting in either a vertical or horizontal motion covering the card and the wood backing. Attach a ribbon to the back to hang it or glue a picture hanger on the back to display on the wall. In addition to decorations and furniture, more practical items can also be made into upcycled goods. Old clothing can easily be made into a variety of projects. 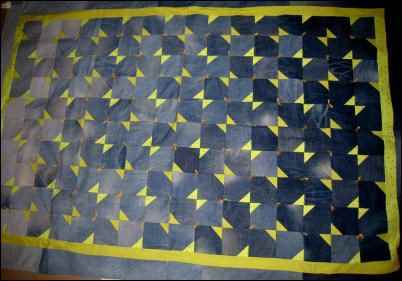 Jeans can be cut into square blocks, sewn, and quilted for a jean quilt. Alternatively jean pockets can be used to make an organizer for art supplies, toiletries or small hardware in your workshop. Cut out jean pockets from old jeans (be sure to cut all the way through the entire jean to include pocket front and back). Using a large rectangle of heavy duty fabric cut to size, sew the back of the jean pocket on in rows. Hang up the organizer in a room that could benefit from a little organization. You can make a nice, warm quilt out of old jeans. Photo by Kirsti I. Other practical items can be made from pallets. Pallets are becoming an increasingly popular material for upcycling. With the rise in popularity however, they can be more difficult to find especially for free. Ask local small businesses or utilize the internet to locate free pallets. Pallets are a great source of lumber which can be used to make almost any project imaginable. One easy project is a pallet organizer for outdoor tools and farming implements. Nail an intact pallet to a barn or outbuilding wall and insert tools in between the slats for an easy storage container. 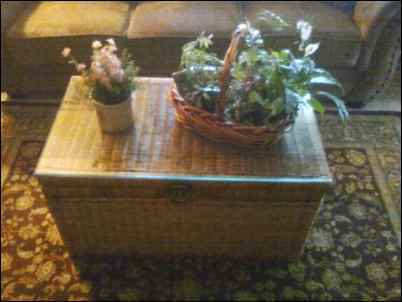 An inexpensive coffee table can be fashioned by using an intact pallet and adding sliding wheels or furniture legs to the bottom. This would also make for a great picnic table for kids or adults who don’t mind sitting low to the ground. Don’t throw out old car tires, or if you are really fortunate, tractor tires. Larger tires such as tractor tires, when filled with sand can be a great sandbox for children. Average-size tires can be made into a classic tire swing. Tie very strong, thick rope around the tire in one spot several times and knot several times to secure. With the other end of the rope, tie and knot to a sturdy tree limb until secure. Be sure to read the label for the rope to make sure it will support the weight of the tire and person who is swinging. Lastly, tires can be used to make a cost effective raised garden bed to contain vegetables and herbs. Place the tire in the desired area, fill with soil and plants. Now that you have some ideas for your next project, review the following tips and advice to help make your venture into upcycling successful. Clean materials (trunks, clothing, tires) before beginning a project. Be realistic. Don’t scrutinize every piece of garbage/recycling leaving your home to see if it can be salvaged. Start small. Begin creating small upcycled projects before advancing to more complicated ones. Choose projects that match your skill level and interest to prevent being overwhelmed. If you find it hard to complete projects, use the “24-hour rule”. Complete your project from start to finish within 24 hours to keep you on schedule. When at home or in the community, be on the lookout for extra materials to upcycle. Make a dedicated work space to keep tools and supplies organized. 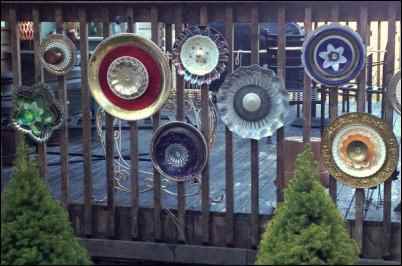 Look for inspiration at flea markets where you will find lots of upcycled projects. When visiting an upcycled furniture shop, I was surprised to see dressers made out of old closet doors selling for over $800. Upcycling has become very popular and many people will pay quite a bit (especially in the cities and suburbs) for these trendy, unique pieces. If you are of the entrepreneurial spirit, you may want to look into selling your creations either online at Etsy or eBay, or at a local farmers market or flea market. If you regularly travel to a larger town, look for a consignment shop where you can sell your products for a certain percent. If you are interested in finding more projects or tips on upcycling, use an internet search engine to search the term “upcycled projects”. Be prepared for thousands of websites with even more projects for added inspiration. You can find more specific results by searching for upcycled projects along with your main material whether it is VHS tapes, tin cans, sweaters, et cetera. Lastly, the next time you are at a flea market or craft fair and see a project you like, speak directly with the merchant and creator of the piece. By networking with fellow upcyclers, you can mutually learn and share so much. By upcycling items that were previous old and useless, you can turn your homestead into a sanctuary with many functional items and beautiful decor. 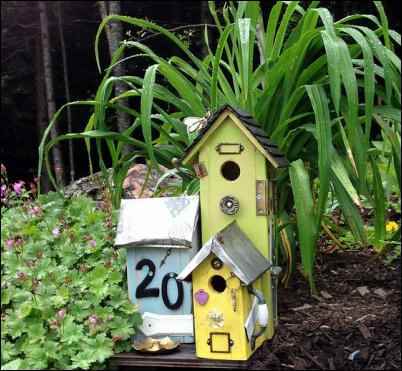 By upcycling recycled materials, you are not only helping the environment but are ensuring your homestead is sustainable. Moreover, upcycling can help you reach your financial goals by minimizing your expenses on furniture and decorations. So next time you consider throwing something away or recycling, consider how you could reuse and reclaim that material to beautify your property.